The unique pleasures of the Drive-In movie theater experience are hard to come by these days. Prolific in the 1950s, usually out in the sticks where they nixed hick pix, their numbers have dwindled from more than 4,000 to less than 300, most of those barely hanging on. 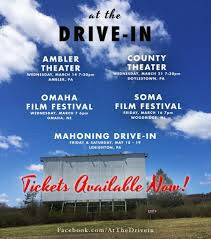 One such venue, the Mahoning Drive-In, located in Lehighton, in rural Pennsylvania, is the subject of Alexander Monelli's excellent documentary At the Drive-In (2017). Movies had been exhibited outdoors since the early silent days, but the first official drive-in theater is generally thought to have been one built by chemical company magnate Richard M. Hollingshead, Jr. in Pennsauken, New Jersey, in 1933. However, it wasn't until after World War II that drive-in theater construction began in earnest, from roughly 1949-1959. Movie attendance was in sharp decline, and for that reason almost no new indoor theaters were built during that decade. Drive-ins were another matter. The postwar baby boom, skyrocketing automobile sales, and the general population shift away from downtowns and into middle-class suburbs made drive-ins appealing to young families with children. Most of the early drive-ins offered playgrounds, some quite elaborate, for kids to burn off energy while their parents enjoyed the latest Randolph Scott Western. Toward the end of the drive-in construction boom, some even featured 70mm projection systems and, in at least one case, three-panel Cinerama. By the 1960s, however, indoor movie theater construction began anew, initially large single-screen suburban theaters, soon followed by theaters offering two or more screens at one location. The drive-in audience gradually shifted away from family audiences to raucous teenager-dominated ones, and by the 1970s drive-in theaters found themselves on land suddenly too valuable to justify the hand-to-mouth revenue a mere drive-in offered; once in the middle of nowhere, theaters found themselves in the middle of the vast suburban sprawl. Untold numbers were razed to make way for shopping malls and parking lots. At the Drive-In traces the 2016 season of the Mahoning Drive-In, a single-screen theater built in 1949. Jeff, the sixty-something manager and projectionist, has leased the property for the last several years, but has been operating at a loss and finds himself at the crossroads: distributors are abandoning the more than century-old 35mm film format in favor of digital projection, rendering his vintage 1949 Simplex projectors obsolete. Ponying up $50,000 to install new digital ones isn't an option. Into the fray steps Matt and Virgil, passionate film student grads who, having stumbled upon the theater by accident, eventually partner with Jeff with a plan to shift the Mahoning from first-run films to summer programs of classic, thematically-linked double features, movies in which 35mm prints are still available, even if only from private collectors like director Quentin Tarantino. Other members of the all-volunteer staff are gradually introduced: the girl at the concession stand, the longest-serving employee; the ticket-taker, who muses about the mice and ants that visit his lonely box-office; the easy-going fry cook, who like several other volunteers crash on air mattresses on the floor of the concession building rather than make the long drive back home each night. One volunteer makes a six-and-a-half-hour trek each summer weekend from another state. Their love of the Mahoning Drive-In, their determination to keep it going, and their passion for the communal viewing experience and of seeing movies on a big screen in 35mm is, at times, quite touching. The ever-grinning Virgil, among others, talks of the drive-in in terms of an escape from the disheartening craziness of the real world, telling director Monelli off-camera that he and his pregnant wife had recently lost their baby. Unmarried, childless Jeff channels what might be a pretty lonely solitary life into providing his patrons with an increasingly rare, wonderful experience under starry skies. Even if just one customer showed up, he insists, he wouldn't dream of cancelling that evening's show, no matter that the cost of electricity alone would mean losing money. With licensing costs averaging around $500 a pop for a single weekend, a single rainstorm could spell financial disaster for this precarious enterprise. And for all their showmanship, dressing up as zombies and the like for one horror-themed weekend, the arrival of a genuine DeLorean for a screening of Back to the Future, etc., can they attract a big enough regular audience to see them through another summer, audiences that could just as easily stream these old movies at home? At the Drive-In predictably does a fine job sketching the history-in-microcosm of drive-ins and the appeal of that form of movie exhibition. Unexpectedly though, the film's greatest achievement is how well in the span of just 80 minutes it digs into the quirky but appealing personalities, more than a half-dozen or so volunteers and audience members. It's hard not to like these people, despite their quirks, like the garrulous film geek who rambles on and on about his film-viewing habits. The people in At the Drive-In reminded me a lot of the late John Harvey, a former Cinerama projectionist who so loved that format during the decades it was all but forgotten that he gutted his modest ranch house in Ohio and converted into a private Cinerama theater, just so that he could share that thrill with others. Harvey's eccentric, outré passion, one that led to divorce and even properly looking after his own health, cost him an ordinary life, yet without his years of dedication in the widescreen wilderness it's doubtful audiences would be able to experience the once nearly-extinct format today. Unquestionably, the Mahoning Drive-In becomes a kind of ground zero of social interaction among film nerds, some of whom, one suspects, would have a hard time personally thriving in a "normal" work or social environment, though it's clear the drive-in also successfully attracts regular customers who find its simple pleasures irresistible. I haven't been to a drive-in myself since 1990, when I went to see Another 48 HRS. at the Wayne Drive-In in Wayne, Michigan. Needless to say, I wasn't there for the movie, which is terrible, but rather because it was one of the very last shows before it was demolished that summer. At the Drive-In is the kind of movie that rekindles that nostalgia, so much so that if not for the fact that I reside literally on the other side of the planet, I'd think nothing of hopping in my car to make the pilgrimage, just as did driving the five-and-a-half hours to see John Harvey's Cinerama set-up back in the early 1990s. Released by MVD Visual, the unrated At the Drive-In looks and sounds great, presented as it is in 1.78:1 widescreen with unspecified stereo surround. No subtitle or alternate audio options but the disc is region-free. Supplements include three audio commentary tracks, all featuring the director and two with members of the cast. Also included are about 17 minutes in deleted scenes, a trailer, and an Alamo Drafthouse post-screening Q&A. One of the best new documentaries I've seen in a while, At the Drive-In is Highly Recommended.